Its official, the worlds gone mad which is unfortunate because with the current lack of Mental Health care units available in the UK means we’ve all got sod all chance of getting a padded cell for a night. Our NHS is bleeding to death and we’re leaving the armies of staff on the Battlefield without scrubs or scalpels, I suspect their patience (though sadly not patients) left the War years ago when the flood of management stepped in with their business brains and spineless approach to patient care. After all, why listen to a Doctor or Nurse, they only save lives not budgets. So today an announcement was made admitting that more and more operations are being cancelled, including essential one’s. Who’s to blame, argues the very important people? Oh the snifflers and snufflers that would rather clog up A&E because they have nothing better to do with 5 hours of their life I guess, Or is it the lazy GP’s that like to finish at 5pm to head home in time for a round of golf and a G&T on their fat cat pay? Perhaps making people pay to fast track their appointments will reduce demand?. Still not sure how this fits more hours into a day already congested with more than just a bad case of constipation. The problem is what happens when the system gets sick, who looks after the doctors, the nurses, the auxiliary workers, the surgeons? 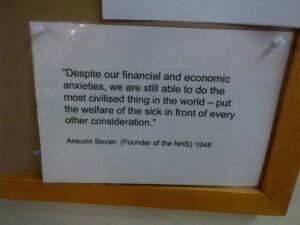 Our NHS? Chances are if your reading this you move, and you move regularly. You might even eat well, drink reasonable amounts of alcohol, don’t smoke and are generally in good nick. That makes you and I 20% of the UK population over 40, that also makes us a minority living in a world where that’s not necessarily an advantage. As we become increasingly isolationist in our thinking, politics and culture its easy to lose sight of just how important it is to keep taking care of the people, communities, services around us. I’m not concerned which side of the Political car crash you are on, the point is all lanes have been taken out if we devalue that which keeps our society our society. I’ve grown up, as have my step children in a Country with free healthcare, my mother worked in it, my friends work in it. My grandmother is looked after by it and it saved my life when my appendix ruptured. The point is it has always taken care of me and my loved ones, its part of my heritage, my society and I love my country for it. It should never have been used as a campaign tool in recent events with promises made up of alternative truths. So why is a Pilates teacher ranting about todays NHS news? 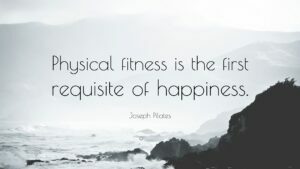 after all, Joseph Pilates predicted exactly where humankind would be long before it was a popular subject for politicians and the media. The truth is we need to protect our Healthcare, you and I are lucky, we get to share the benefits and gifts of being healthy and active. We know the joys of not being dependant on medication as a result of poor lifestyle choices and education. As our NHS gets sicker and as our population gets sicker the fit and well will bear the brunt of caretaking and it wont be pretty. That powerhouse is going to come in handy when we’re carrying the weight of a chronically sick society on our shoulders. We all make choices everyday, about ourselves, about others. We make choices about what we believe and how we behave as a result. So in a world that appears to be worshiping at the alter of Self don’t forget your life is dependant on others, others whose name you don’t know, lives you haven’t lived and you are never likely to know. Perhaps one day someone might have to save your life, lets hope there’s a bed available..